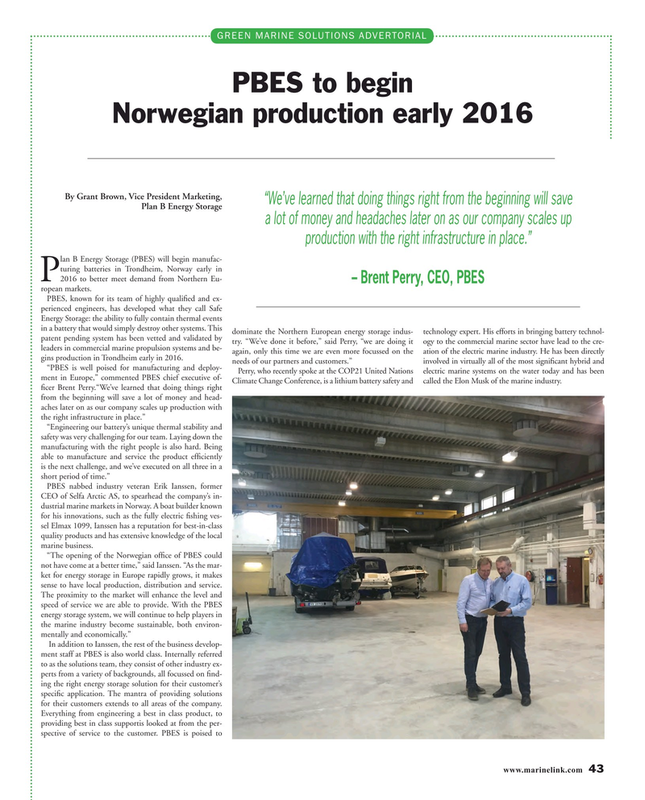 P2016 to better meet demand from Northern Eu- – Brent Perry, CEO, PBES ropean markets. Energy Storage: the ability to fully contain thermal events in a battery that would simply destroy other systems. This dominate the Northern European energy storage indus- technology expert. His efforts in bringing battery technol- patent pending system has been vetted and validated by try. “We’ve done it before,” said Perry, “we are doing it ogy to the commercial marine sector have lead to the cre- leaders in commercial marine propulsion systems and be- again, only this time we are even more focussed on the ation of the electric marine industry. He has been directly gins production in Trondheim early in 2016. CEO of Selfa Arctic AS, to spearhead the company’s in- dustrial marine markets in Norway. A boat builder known for his innovations, such as the fully electric ? shing ves- sel Elmax 1099, Ianssen has a reputation for best-in-class quality products and has extensive knowledge of the local marine business. “The opening of the Norwegian of? ce of PBES could not have come at a better time,” said Ianssen. “As the mar- ket for energy storage in Europe rapidly grows, it makes sense to have local production, distribution and service. The proximity to the market will enhance the level and speed of service we are able to provide. With the PBES energy storage system, we will continue to help players in the marine industry become sustainable, both environ- mentally and economically.” In addition to Ianssen, the rest of the business develop- ment staff at PBES is also world class. Internally referred to as the solutions team, they consist of other industry ex- perts from a variety of backgrounds, all focussed on ? nd- ing the right energy storage solution for their customer’s speci? c application. The mantra of providing solutions for their customers extends to all areas of the company.